My theme has a post type called 'portfolio'. 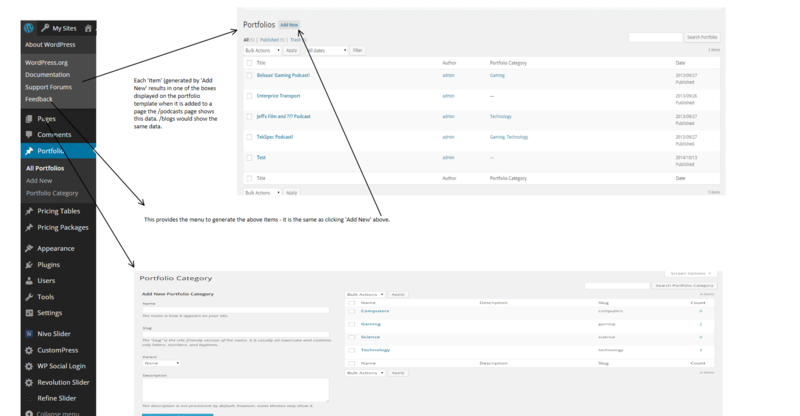 When going in the theme and adding a "new page" it is created by going to templates and selecting "portfolio". It appears that there can only be 1 portfolio per wordpress site, I would like to have multiple. Note: the "Add New" under the template simply adds a field which shows up in the template. I would like to have something like Portfolio1, Portfolio2, Portfolio3 so that each would have independently added content. Is there any way I can do this with CustomPress? When I go in to Taxonomies in CustomPress and select 'Add New' under the post types there is one listed as "my_portfolio"
Access should be enabled to my site, any help would be tremendously appreciated! Hello, Ser Stewart of House Abraxas. It looks like support access has expired, or the token didn't take, if you can reenable it, I'd be happy to look at your CustomPress settings for the Portfolio CPT. I'm pretty sure I can just tick a few boxes and get you going again. : ) CustomPress is my favorite plugin (it recently usurped Ultimate Branding) that we offer, but sometimes you have to tell it it's pretty to make it work the way you want. I just pressed the "extend" button and received this message: "Support access is ACTIVE until October 21, 2014 12:31 am" So I think you should be good to go. Yeah, I'm a totally new person to Wordpress so the terminology is confusing me and I don't yet understand how themes actually work so I don't know where I could go and copy/rename the portfolio options from within the existing theme. Thanks so much for any help and let me know if I need to do anything else for enabling support! Any chance you need anything else or is it working now? Your portfolio is a custom post type, so to have another one you will need to make another portfolio custom post type. Then they will be completely separate. Another option is to use your categories then link to each category page directly, then they will look separate to the user, that is likely the easiest way to go. The option you're looking for may already be built into your theme. Unfortunately, I'm having issues loading your site - it continuously loads. Taking several minutes to load any pages. Do you mind taking a picture of the add new portfolio editor so we can see what options are available there? As far as your request, I'm not sure where you saw "Set up Multiple Portfolio Pages" but here are some images to hopefully help! Let me know if you need anything else! The site appears to be navigating better now. My apologies for the delay here! Thanks for all your patience. Do you mind sending your FTP and WP login credentials in so we can grab the theme from you via FTP and test it on our own installation? In the meantime, since it's a premium theme, it might also be a good idea to contact their support and find out what they think the best root would be since they will be most familiar with the development of the theme. Look forward to hearing back Stewart! We worked this out - we are using subdomains (blogs.site, streams.site, etc.) in order to have unique portfolios for each type; it's not ideal but it's not worth devoting lots of time to come up with a better fix at - at this point in time at least. Thanks SO SO SO much for your help!